Identification: This species has a translucent-cream body with extensive olive-green pigment. The rhinophores and cephalic tentacles have medial orange bands and the former have gray tips. That character and the lack of opaque white pigment distinguish it from Eubranchus sp. #2. Natural history: The single known animal was found on algae collected by Cecile Walsh on the Big Island. It showed a diurnal activity pattern when held (Daniel Jennings-Kam, pers. com.). Taxonomic notes: It was first recorded in Hawaii from the Big Island by Cecile Walsh and Daniel Jennings-Kam on Sept. 1, 2014. 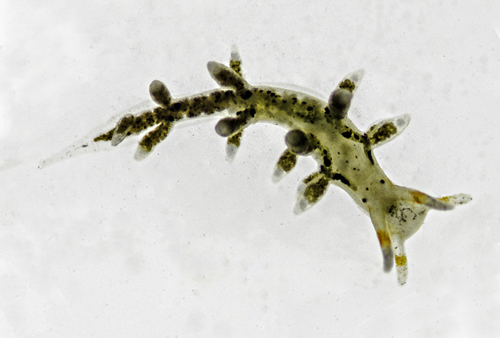 Although the overall "gestalt" seems closer to Eubranchus, there's some chance that this species could turn out to be a Tenellia or Tergipes, instead. Photo: Daniel Jennings-Kam: 3 mm: found by Cecile Walsh, Big Island; Sept. 1, 2014.